MGMT is an American psychedelic rock band based in Brooklyn, New York, founded by Benjamin Goldwasser and Andrew VanWyngarden. After the release of their first album, the members of their live band, Matthew Asti, James Richardson, and Will Berman joined the core band in the studio. Formed at Wesleyan University and originally with Cantora Records, they signed with Columbia Records and Red Ink in 2006. Their first album as MGMT, Oracular Spectacular, debuted at #12 on the UK album chart and number six on the Australian ARIA Charts, and hit number one on the Billboard Top Heatseekers chart. It has also been named the 18th best album of the decade by Rolling Stone magazine. It was named the best album of 2008 by NME. 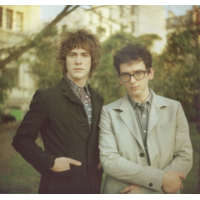 MGMT also appeared prominently in Australia's Triple J Hottest 100 2008, coming in 2nd with "Electric Feel", 5th with "Kids" and 18th with "Time to Pretend". MGMT was nominated for the 2010 Grammy Award for Best New Artist, and their track "Kids" was nominated for Best Pop Performance By a Duo or Group with Vocals. These are the first Grammy nominations for the band. At the 2009 Grammy Awards, the Justice remix of "Electric Feel" won the Grammy for Best Remixed Recording, Non-Classical. In July, 2010 MGMT opened for Night Beats at Seattle's annual "Capitol Hill Block Party".